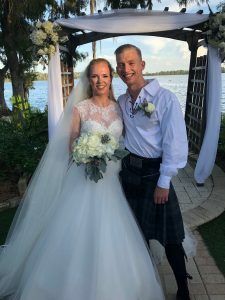 For what seems like a world away, Danielle and Christopher traveled from their home in Scotland to unite in marriage at the beautiful Paradise Cove in Orlando, Florida. From the very beginning of their conversation with me, they exuded a young love for each other that was so very refreshing. They were genuinely grateful for their family and friends that traveled such a great distance to come and be there with them on their wedding day. Clad in heavy wool kilts made of their family tartan and adorned with sporran to keep them down in the Florida breeze, the gentlemen made their entrance to the ceremony in the Paradise cove ski boat. Danielle was dressed in a stunning form filling white dress with lace adorning her shoulders and neck, while her bridesmaids wore rosy/lavender dresses of various styles. The couple worked with Rev.Glynn Ferguson of Sensational Ceremonies to create a custom ceremony that was filled with both laughter and tears. They also included a unity sand ceremony to represent their two lives being joined together as one. Cricket’s Photo and Cinema captured every moment with the two of them, their family and friends. From the bride getting ready and the boat entrance, to the ceremony and first dance, they got it all. The couple used Married by Mail to obtain their Florida Marriage License long before they arrived for their wedding. Your Orlando DJ took care of the music of Mission Impossible as the gentlemen made their boat entrance and kept them dancing for the reception. Growing up in Scotland Andrew’s grandfather was always a part of his life. His grandfather was the plant manager for a Scottish Whiskey Distillery for a number of years. So when Andrew was getting married his family wanted a way to pay special tribute to the bond between Andrew and is deceased grandfather. Andrew’s dad went on a quest to find a bottle of whiskey, make in the distillery, and bottled on the day that Andrew was born. It took almost two years and traveling all over the county, but on their wedding day, Andrew’s dad gave his son this bottle from is grandfather’s distillery.